When we think of a bride’s style on her wedding day, the first thing that comes to mind is, undoubtedly, the wedding dress. But apart from the dress, there are many other things that a bride chooses to complement her overall look. Wedding jewelry, for example, adds sparkle, style and character that emanates the bride’s own tastes and personality. Learn how to choose jewelry for your wedding in 5 steps and look radiant on your big day. The first thing to keep in mind when choosing your bridal jewelry the type of dress you have chosen. A design with a full skirt design is not the same as a figure-hugging straight dress, for example. Different jewelry pieces are perfect for different gowns, and so knowing what suits best is essential to help you narrow down your search. Strapless. 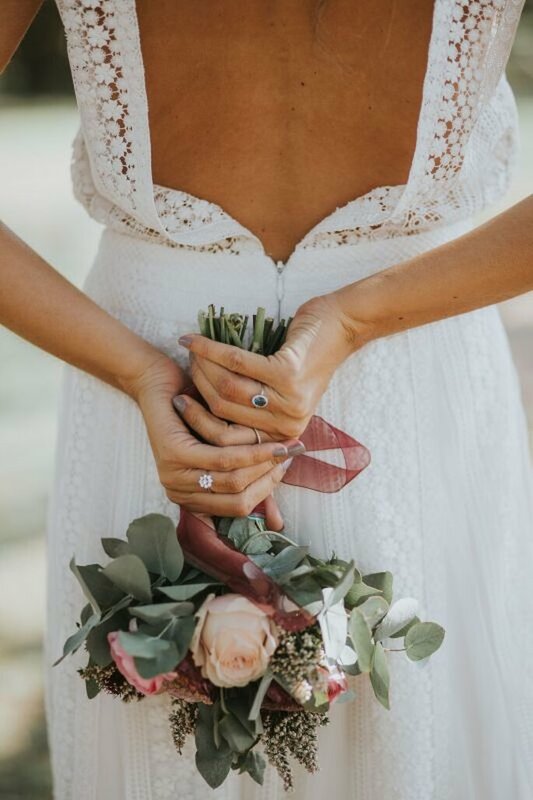 If you love strapless or sweetheart necklines that have your neck and collar bone area on display, then avoid elaborate jewelry combinations. Choose a fine necklace with small stones accompanied by subtle earrings. Another option is to set aside one of the two and to wear long earrings or a striking necklace. Square neckline. Choose a necklace that isn’t longer than your neckline, as it should remain a few centimetres on top. The ideal would be to choose a choker, or a a simple diamond necklace. For the chain, you can choose either fine or thick, depending on your style. Another solution is to wear a pair of dangling earrings without a necklace. Boat neck. For this type of neckline, which is closed yet elegant, stones or small sparkles with a fine chain of silver or gold are perfect. 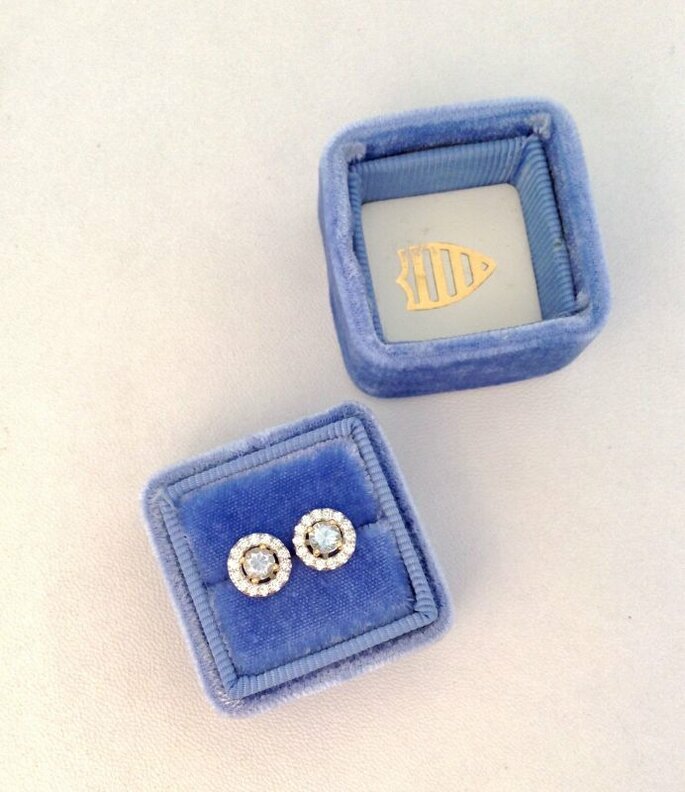 In this case you should wear some earrings as they will give more depth to your eyes. 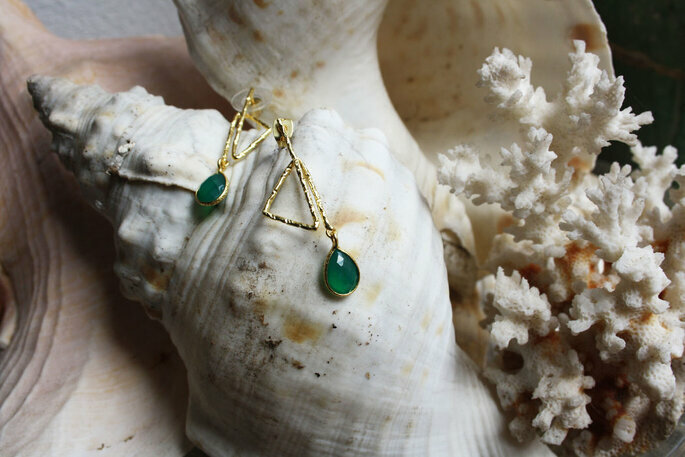 You a pretty pair of colored stone earrings will really stand out. Illusion neckline. This neckline creates an illusion effect by adding a tulle layer to the what is usually already a sweetheart neckline. With the business of this design around the chest and shoulders, it is best to avoid wearing a necklace and stick to simple pendant earrings. Halter neck. This can be one of the most sensual necklines, so in this case, the less jewelry you wear, the better the elegance. You could instead opt for other accessories such as headdresses or flower wreaths. Asymmetric neckline. If you have opted for a wedding dress with a simple cut, then splash out on beautiful or dramatic jewelry. On the other hand, if your asymmetric neckline has embroidery or is adorned with rhinestones, then stick to simple or minimal jewelry. 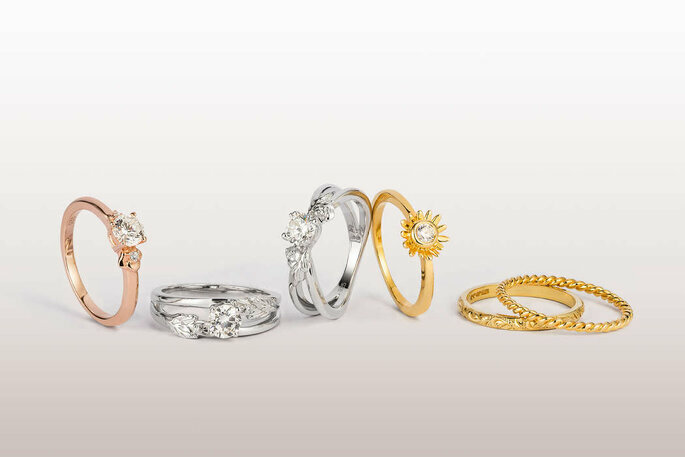 For white diamond wedding dresses, choose yellow or rose gold jewelry. If you choose an ivory wedding dress then gold jewelry is better suited to complement the fabric. Yellow gold, polished silver and precious stones are ideal for champagne-colored wedding dresses. Lastly, if your gown is more original, with a pastel blue or pink, then look for platinum, rose gold or diamond jewelry. Overall, it is essential to have a basic idea of what goes with what and to buy your dress before choosing your wedding jewelry so that you necklace or earrings simply complete your look. One of the other things to bear in mind when it comes to your jewelry is the hour of the wedding, since, as with the dress code for the guests, the protocol or style of your outfit will be best suited to either a day or evening occasion. If you are celebrating your wedding during the day, then simple and fine jewelry is recommended. If, on the other hand, your wedding will be an evening affair, then you can dazzle with sparkly or colorful jewelry. Also take the wedding venue. For example, a garden or outdoor wedding requires minimal jewelry, or instead, bohemian/vintage hair accessories. Whereas a grand ballroom or elegant hotel wedding would be a style more suited to diamond jewelry. 3. Choose your jewelry according to your hairstyle and facial shape. Every hairstyle and face shape varies – we are all unique. But it’s good to know which styles complement certain looks. If you have decided on a low bun or a semi-pulled hairstyle, choose short or round designs. You will look gorgeous wearing pearls and diamonds. If you are going to have a loose bridal hairstyle and you think that the length of your hair will overshadow subtle jewelry designs, then opt for something more striking with rhinestones or medium size hoops. For short hair, long earrings are fabulous. If you have a rounded face shape, choose an elongated necklace. This, along with button earrings, will refine your features. If, on the other hand, your face is square, avoid symmetrical or angular jewels and choose something more curvilinear. If your face is long, invest in voluminous and timeless designs that you can reuse and cherish for a lifetime. Choosing a good bridal headdress is increasingly important to modern brides, and easy, due to the large number of designs, styles and sizes there are of headdresses, flower crowns, tiaras and hair brooches. Once you have chosen the perfect bridal headdress for the big day, you can decide what jewelry to pair it with. If you are going to get a striking bridal headdress, use earrings and a small necklace. If your headdress is small, try to combine it with medium size jewelry, being a little bigger if your hair accessory is a brooch to complete the hairstyle. Among the things you shouldn’t forget when planning your wedding look is that sometimes, less is more. We recommend that you wear no more than 3 accessories in total, and your natural beauty and unique style will shine. Also, remember not to mix the metal type. If you choose gold for example, then make sure all your jewelry is the exact same. This applies to silver and rose gold, too!